Vă rugăm să vizitați unul dintre site-urile noastre de țară pentru a găsi informații locale. Dacă țara dvs. nu este în listă, consultați Contacte globale. 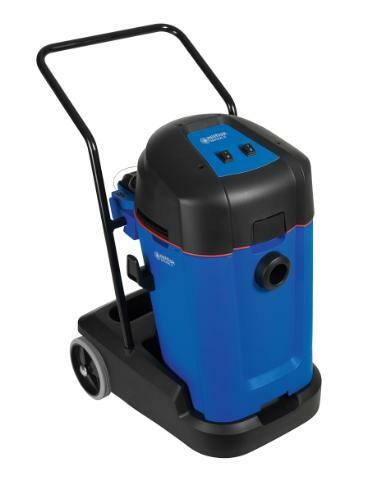 MAXXI II 55 offers easy and efficient wet & dry use without filter changing. The unique dual filter makes it possible to clean both wet and dry applications without the need to spend time on changing filters. Thanks to MulitFit all MAXXI II tools are compatible with the ATTIX accessories. The MAXXI II wet and dry vacuum cleaner presents a number of innovative design features making everyday operation and maintenance easy, ergonomic and more productive. By designing a special motor head, it has become easier and safer to operate the machine such as emptying the container. The container can be emptied either through tip and pour or by using the drain hose, without removing the motor head. When lifting the container it is advised to lift the container with one hand and hold the machine firmly with the other hand on the steel push handle. MAXXI II 55 is equipped with a stand alone trolley and is ideally suited for demanding jobs, especially in rough and wet environments such as building sites, light industry and for cleaning up after plumbers, electricians and other contractors. Nilfisk și membrii Nilfisk Group mă pot contacta prin e-mail cu privire la companiile, produsele și serviciile noastre, prin comunicări de marketing direct. Faceți clic aici pentru informații suplimentare.